Archives : RISING GAP HOLDS THE MARKET - 23/11/2012. RISING GAP HOLDS THE MARKET – 23/11/2012. SHORT & MEDIUM TERM TRENDS TURN DOWN. Both the indices have been falling after making an intermittent high of Sensex 18973 and Nifty 5777, three weeks ago. This week both Sensex and Nifty made a lower bottom at Sensex 18255 and Nifty 5548. Both the indices bounced from a support area which is defined by the Bullish Rising Gap between Sensex 18284-18062 and Nifty 5526-5447. Despite the bounce seen during the week, the short and medium term trends have turned lower. Sensex opened the week at 18349, made a high of 18567, low of 18255 and closed the week at 18506. Thus it registered a weekly gain of 197 points. At the same time the Nifty opened the week at 5577, made a high of 5643, low of 5548 and closed the week at 5626. Thus the Nifty went up by 52 points on a weekly basis. Both the indices made a Tweezer formation at the start of the week on Monday and Tuesday. Sensex made a Tweezer bottom at 18255 and Nifty 5548. On Friday both the indices have formed a small black body with a long lower shadow and a small upper shadow almost like Hanging Man. But the body has to be higher if it has to form a Hanging Man which is not the case here. On the weekly charts there is a Bullish Harami formation which is a bullish reversal pattern which requires confirmation. Both Sensex and Nifty are undergoing a correction of the immediate rise of Sensex from 17250 to 19137 and 5215 to 5815 for the Nifty. The Retracement levels for the Sensex are at 18416-18193-17971 and 5586-5515-5444 for the Nifty. The Sensex has bounced from a low of 18255 and Nifty from 5548 this week. Thus the indices have bounced back from just above 50% Retracement level for the indices. A breach below the low of the week, will resume the correction. This week both the indices bounced back from Sensex 18255 and Nifty 5548 which is within the Bullish Rising Gap between Sensex 18062-18284 and Nifty 5447-5526. This gap has acted as a strong support for the market even before as the Sensex had bounced back from a low 18291 and Nifty 5534. This gap holds more significance because the 50% Retracement of the immediate rise from 17250 to 19137 for the Sensex and 5215 to 5815 for the Nifty (which is at 18193 and 5515) is also within the Gap mentioned above. The indices have managed to remain below the short term average of 20dma (Sensex – 18587 and Nifty – 5653), and medium term average of 50dma (Sensex – 18610 and Nifty – 5652). But both the indices are well above the long term average of 200dma (Sensex – 17555 and Nifty – 5328). Thus the trend in the short term and medium term timeframes have turned bearish, but the trend in the long term timeframe continue to be bullish. MACD and ROC are both negative and continue with their Sell signal. RSI continues to remain below the centerline at 47 and so does the MFI which is also at 41. The Stochastic Oscillator has given Buy signal as %K (35) has gone above %D. ADX has dropped to 20 indicating that the uptrend has lost its entire strength. The Directional Indicators i.e. +DI and –DI have given a Sell signal. OBV continues in Sell mode. The Nifty O.I. PCR has reduced to 1.03. The highest Open interest build up for the November series is at 5700 Call. This suggests that the market expects strong resistance around 5700 levels. For December series highest Open Interest buildup is seen at 5500 Put and 6000 Call which suggests a wide trading range for the Nifty with support coming in at 5500 and resistance around 6000 levels. On Friday, Nifty 5700 strike has seen high Call writing and hence one can expect a strong resistance at Nifty 5700 in the short term. Trendline Support for the Sensex is at 18258. Trendline Resistance for the Sensex is at 18882. Trendline Support for the Nifty falls at 5541. 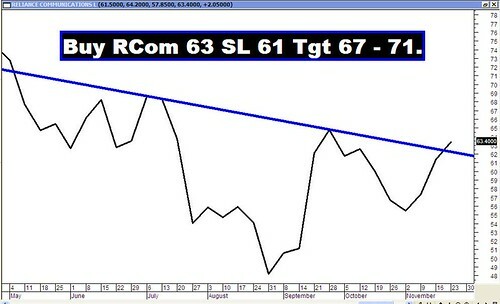 Trendline Resistance for the Nifty is at 5756. For the week ahead, Sensex will find Support at 18231-17972-17726 and will find Resistance at 18812-19137-19484. For the week ahead, Nifty will find Support at 5534-5448-5360 and will find Resistance at 5720-5815-5901.